Sharp, lucid examination of Australia’s establishment as a white-occupied country, largely effected by the genocidal treatment and displacement of the aboriginal population. Swedish historian Lindqvist (“Exterminate All the Brutes,” 1996, etc.) focuses his inquisitive eye on one particular territory: the flat, barren Moorundie, inconspicuously occupied for 5,000 years by the Ngaiawong tribe. Visiting the area in 1839, John Eyre deemed it “paradise…an ideal site for settlement” and promptly purchased 1,411 acres from the Australian government. 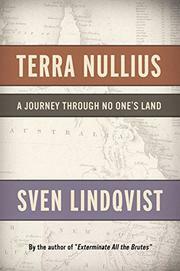 “An unspoken condition of the sale,” writes Lindqvist, was that the land “was what was called ‘terra nullius,’ no one’s land.” It didn’t belong to anyone else in the eyes of encroaching white leaders, who countered Ngaiawong resistance with a massacre that nearly eradicated the entire tribe. Whites became the dominant force, led by Alice Springs mounted policeman William Willshire, who in the 1880s and ’90s executed without trial as many as 1,000 Aborigines, mostly for cattle-stealing. Lindqvist covers an impressive amount of ground in his characteristically dense, comprehensive narrative, which is invigorated by pages of illustrations, the author’s vivid dreams and chapters on Australian oddities. The country’s history, geology, botany, distinctive landscape, beguiling kangaroo culture and theories on kinship are all given their due. This lighter material tempers the grim descriptions of merciless carnage inflicted on Aborigines, forcible internment on bleak coastal islands of tribal women infected with syphilis by white men and brutal relocation of “half-castes,” fair-skinned, often mixed-blood Aborigines who were removed from their families and sent to perform manual labor for whites. Lindqvist praises the resiliency and artistic skills of the Aborigines, expressing hope that one day the Australian government will pay the “moral debt” it owes this long-suffering people. A gruesome, chilling anthropology lesson from an unconventional instructor.